+49 30 201 44 610 or email us info@paulig-eye-clinic.de. 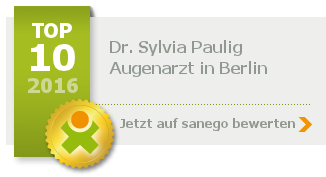 Welcome to the Paulig Eye Clinic – your eye specialist in Berlin Mitte. At our eye clinic in Berlin Mitte, we offer the highest standards in diagnostics and therapy based on the latest scientific findings. We continuously develop our professional competence through studies, congresses and cooperation with colleagues worldwide. Thanks to this international reputation, the Paulig Eye Clinic in Berlin Mitte is one of the most respected institutions worldwide. You will find in our clinic an open, friendly atmosphere with feel-good character and learn through our dedicated, excellently trained team a maximum of loving human attention. Visit our newly designed beauty lounge in Berlin Mitte and experience the world’s most effective treatment methods and luxurious, highly effective cosmetic products. Dr. Paulig is board member of the Ghorfa. We support the activities of the police against child crime in schools. We are sponsors and additionally have a chair sponsorship in the historical Staatsoper Berlin Unter den Linden. We are sponsor of the Staatliche Ballettschule Berlin.